Srinagar, Nov 8: Demanding a high-level probe in the ‘issue of doling out secret packages to the members of Kashmiri Pandit community over the past so many decades’, All Parties Sikh Coordination Committee (APSCC) said that the successive governments in the state and center have been very kind enough to Kashmir Pandits by sanctioning packages for them at the cost of majority Muslim community and minority Sikh community. 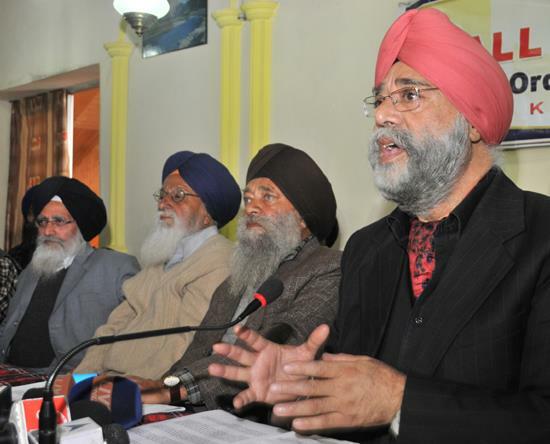 “We are demanding that a high-level probe should be ordered in the issue of doling out secret packages to the members of Kashmiri Pandit community over the past so many decades especially after the onset of militancy in Kashmir,” All Parties Sikh Coordination Committee (APSCC) chairman Jagmohan Singh Raina said in a statement issued here on Thursday. Mr Raina further said that the probe should be carried out by a team comprising of some seasoned members of the parliament or by a sitting judge of the Supreme Court. “Over the years it has been observed that the governments in New Delhi have been announcing packages for Kashmiri Pandits and nothing has been done with respect to the Muslim and Sikh communities. Sikhs are up against many odds and are facing difficulties with regard to employment, political representation and assistance on the business as well as agriculture and horticulture sectors,” Mr Raina said. The APSCC Chairman said that a thorough probe would expose the officials who have been doling out packages to Kashmiri Pandits from time to time. He said that since people involved in different scandals have been exposed time has come when the same parameter is applied vis-à-vis sanctioning undue and un-favourable packages for Kashmiri Pandits. “The SRO 425 issued in October 2017 by the state government to provide government jobs under the Prime Minister’s package to Kashmiri Pandits who have not migrated from the valley is an act of gross discrimination against the Sikh community since Sikhs did not move from valley as soon as militancy began in the valley,” Mr Raina said. “Sikhs living in Kashmir should be thankful to S Santpal Singh, S Harjeet Singh and A Vikramjeet Singh advocate and others who took the bold initiative of filing a writ petition in the Jammu & Kashmir High Court while challenging the SRO 425. There is a simmering discontent among Sikhs with regards to SRO 425 and the same has added to the woes as well as the agony of the community members,” Mr Raina said. The APSCC Chairman asked the members of Sikh community to stand up and wage a battle against the injustices that are meted out to them by the people at the helm of affairs in New Delhi and Jammu and Kashmir. He sought a moral, physical and financial support for the members of the community who have challenged SRO 425 in the court of law. “Time has come when we shall get united and take a bold initiative so that our youth are given jobs that have been denied to them on one pretext or other. Sikhs should leave the casual approach and it is time to become more pro-active so that rights are given to us more so when the same are guaranteed by the constitution,” Mr Raina said.